Stump Smash was once a magical tree that spent most of his time sleeping peacefully in the forests of Skylands. Then one day he awoke to discover his entire forest had been chopped down by trolls – himself included. His long branches were gone, leaving him with only powerful mallets for hands, which he used to smash the troll tree-cutting machines. A new range of characters to develop the ultimate collection. 8 new and unique Skylanders, one for each element group. 24 redesigned Skylanders with increased powers, level caps and abilities. For ages 7 years and over; EAN/MPN/UPC/ISBN: 5030917116452. 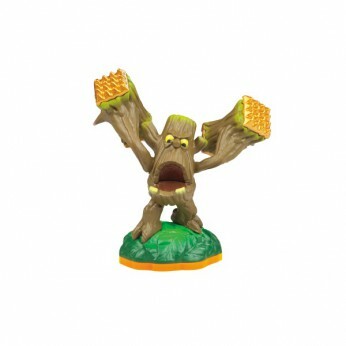 This toy costs approximately £6.74 (for the latest and best prices make sure you check our retailer list for the Skylander Giants: Single Figure – Stump Smash above). In our review of Skylander Giants: Single Figure – Stump Smash we classed it as being suitable for ages 8 years, 9 years, over 10 years but recommend you check the manufacturer specific advice before purchasing.